The 2019 Stanley Cup Playoffs are finally upon us. Before the first puck drop, it’s high-time to revisit Point Share Shells one more time to see which teams enjoyed high-octane offence and which teams sorely suffered to score. The story lines from this season are abundant: from Tampa Bay’s offensive dominance led by Nikita Kucherov, to Anaheim’s complete inability to give John Gibson any goal support, to Connor McDavid, Leon Draisaitl, and Patrick Kane each putting up 100+ point seasons and missing the playoffs. From a team scoring perspective, there’s a lot to digest when looking at all 31 teams. The shells aid in getting a better sense of how teams scored throughout the season, differentiating teams from one another while still seeing individual contributions to team scoring success. The updated shells are below, which includes data for the entire 2018-19 season. There are a few standout performances among the top offensive teams this year. The Lightning, Flames, and Sharks all hold a unique significant stat that cements their offensive prowess in different ways. The Tampa Bay Lightning offence was untouchable; their players combining for 71 more points than the next best teams, Calgary and San Jose. Compared to the worst offences in the league, the Lightning combined for 340 more points than Anaheim and Los Angeles. To put the disparity into context, on the Lightning, Kucherov’s whopping 128 points accounts for 14.8% of all points scored by Lightning players. If he was a member of the Ducks or Kings, that number sky rockets to 24.5%. Further, Steven Stamkos and Brayden Point‘s 98 and 92 points combine to make the Lightning the only team with three 90+ point scorers. No other team has three 80+ point scorers, let alone 90+. The Bruins came close with Brad Marchand‘s 100, David Pastrnak‘s 82, and Patrice Bergeron‘s 79. Had Pastrnak and Bergeron not missed time due to injury, there’d be no doubt that the Bruins would have given the Lightning a run for their money for having the top trio in the league. Outside of the trio, the Lightning are one of the deepest teams in the league. They have a plethora of players capable of offence, with an addition nine players putting up 30 points or more on the season. Victor Hedman leads this group with 54 points. Unfortunately for Karim Kurji’s coining of the Flames’ “Fantastic Five“, Christian Roatis’ (of FlamesNation) “Fab Five” reigned supreme in hockey moniker folklore. Sorry, I don’t make the rules. All season long, the Flames’ group of Johnny Gaudreau, Sean Monahan, Elias Lindholm, Matthew Tkachuk, and Mark Giordano as a group have blown through scoring threshold after scoring threshold. Earlier in the season, they were the only team with five 50+ point players, which then turned 60+, and now finally 70+. In doing so, the Flames accomplished a feat that hasn’t been done since the 2000-01 Penguins. The San Jose Sharks also boasted their offensive depth this season. 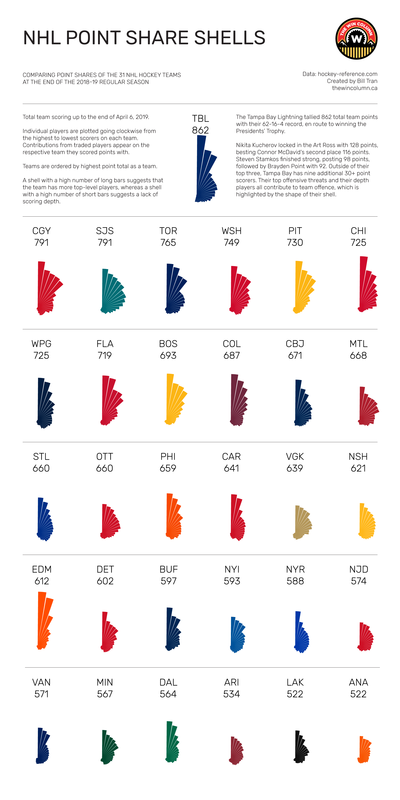 Exactly tying the Flames in total team points at 791, the Sharks’ depth is even more spread out. They are the only team in the league with eight 50+ point scorers. They’re also the only team in the league with seven 50+ point scorers. They’re also the only team in the league with six 50+ point scorers. That’s a level of depth that is simply unparalleled this season. With that many players being offensive threats, the Sharks enjoy a very well-rounded attack. They’re led by Brent Burns‘ 83 points, followed by Tomas Hertl‘s 74 and Logan Couture‘s 70. Timo Meier and Joe Pavelski have 66 and 64 points, respectively, and the octet are rounded out by Evander Kane and Kevin Labanc both posting 56 points, and finally Joe Thornton‘s 51. On the other side of the spectrum, three Pacific Division teams that have been at the bottom of the league in terms of team points all season long just couldn’t find a way to catch other teams. The Arizona Coyotes and Anaheim Ducks both have rosters without a single 50 point player. Granted, both teams went through their fair share of injuries. Clayton Keller‘s 47 and Ryan Getzlaf‘s 48 points lead their respective teams. The Los Angeles Kings at least have two 50+ point scores in Anze Kopitar and Dustin Brown, but they were tied with Anaheim for the lowest total points at 522. The Dallas Stars and New York Islanders are both made it into the post season. The Stars are in a Wild Card position in the treacherous Central division, and the Islanders have home ice advantage in first round as the Metropolitan’s second seed. The Stars are 28th in total team points, and the Islanders are 23rd. In terms of goals for, the two teams are 29th and 21st, respectively. What they lacked in offence, their goaltenders more than made up for with best-in-league goaltending. The Stars were led by Tyler Seguin and Alexander Radulov, who posted 80 and 72 points, respectively. Jamie Benn was a distant third at 53 points. John Klingberg was fourth on the team at 45 points, Miro Heiskanen fifth at 33. Having a bit more spread out offence, the Islanders’ Mathew Barzal posted a team-best 62 points, with Josh Bailey, Brock Nelson, and Anders Lee all being 50+ point players. Neither team exactly sounding the goal horns often, the Stars’ Ben Bishop and Anton Khudobin and the Islanders’ Robin Lehner and Thomas Greiss were the difference makers. They all played well enough to earn wins, and more than made up for lower-end scoring. The two teams had the best goaltending in the league this season, and will vie for the Stanley Cup in spite of scoring goals infrequently. Seriously, remember to hug your goalies. the two most exquisite qualities. Depth and substance, the two most exquisite qualities, be it in a regular ol’ hockey team or a Stanley Cup Champion. In all likelihood, it’ll be the teams with scoring depth that enjoy long playoff runs. However, it goes without saying that the playoffs are an entirely different beast from the regular season, and anything can happen. There’ll be plenty more stories written in the coming months about the sixteen teams playing for the Stanley Cup. Were there any other teams that stood out in the Point Share Shells? Leave a comment below or @wincolumnblog!